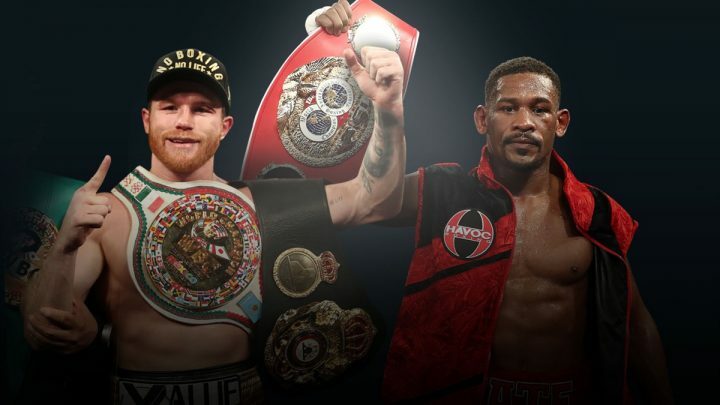 By Dan Ambrose: Saul Canelo Alvarez will find a way of beating IBF middleweight champion Daniel ‘Miracle Man’ Jacobs (35-2, 29 KOs) in their fight on DAZN on May 4, according to Teddy Atlas, who chimed on the subject of the Canelo-Jacobs fight on his recent podcast. Atlas is predicting a competitive fight between the two, but he still thinks that Canelo (51-1-2, 35 KOs) will ultimately get to the 32-year-old New Yorker Jacobs with body shots to win the fight. Atlas didn’t touch on the fact that Canelo has been involved in a lot of controversial fights recently where he could have and perhaps should have lost. Atlas left out the controversial fights Canelo has been involved with against Gennady Golovkin. That would have an important thing to talk about. If Jacobs can only win by knockout on May 4, then he’s got his work cutout for him. Canelo has never been knocked out before, because he takes a good punch and he’s an excellent counter puncher. To knockout Canelo, it’s going to require someone that jumps on him with a steady of speedy shots, and is willing to take his counter punches in return. Jacobs has a chance of knocking Canelo put if he flurries on him like he did against Peter Quillin, but he’s not going to stop him if he throws one punch at at a time. “Jacobs is a top level middleweight. Yes, [he’ll put up a great battle], but to what point” Teddy Atlas said on his podcast about Jacobs’ fight against Canelo Alvarez on May 4. “In the end, Canelo will get the opportunity to hurt him to the body or to the head, and it’ll come down to how the chin of Jacobs can hold up against the pressure and the power of Canelo. I’ve talked about the body work. He showed good body work in the Golovkin fight,” Atlas said. Canelo was able to land some body shots against Golovkin in their second fight last September because GGG was standing in the pocket willing to trade with him. It’s going to be a lot tougher for Canelo to try and land body shots against the fleet of foot Jacobs. Although Jacobs was knocked out in the fifth round by Dmitry Pirog nine years ago in 2010, that was against a 5’11” fighter with quick feet. Canelo is only 5’8″, and he’s got short, slow legs, and he’s not fast at cutting off the ring. Golovkin was able to elude Canelo when he wanted to in their second fight. If Jacobs decides to move a lot against Canelo, then it’s going to be a long night for the Golden Boy star, because the fight will be fought at range. Jacobs is clearly going to stay on the outside and drop jabs on Canelo the entire night, which is going to be very hard for him to counter. It’s possible for shorter fighters to counter a jab when they have fast feet, but not when they’re slow and unable to get near enough to counter. Jacobs could wind up jabbing Canelo to pieces the same way Floyd Mayweather Jr. did in his win over Alvarez in 2013. Jacobs will still probably need to out-brawl Canelo if he wants to win, because the judges aren’t likely going to give him the victory over a popular fighter like Alvarez. If a popular guy like GGG wasn’t able to get a decision against Canelo, despite out-boxing him for 12 rounds, then Jacobs won’t either. If Jacobs wants to win the fight, he’s going to need to treat Canelo like he’s another Peter Quillin or Sergio Mora. In other words, Jacobs will need to try and knock him out. “Will the boxing skills of Daniel Jacobs show where he doesn’t allow Canelo to touch his chin?” Atlas said. “Canelo will probably find a way with his pressure and body work. One way of taking away the defensive abilities of Jacobs is to go to the body. Canelo has that ability to go to the body to get Danny to stand there more to punch with him, and to stop the head movement. Canelo will likely get his way to find a way to win the fight, but I think it’s a competitive fight. I think Danny’s one of the top guys at middleweight,” Atlas said. Jacobs is too smart to fall victim to getting hit by body shots from Canelo. If Jacobs is going to lose the fight, it won’t be from body shots. It’ll be from Canelo getting close enough to land his left hook or right hand to the head. Jacobs isn’t a rank amateur type of fighter like Canelo’s last opponent Rocky Fielding. Jacobs actually knows how to fight, and he’s smart, very smart. He’s not going to suddenly lose his ring IQ and go to the ropes to cover up the way Fielding foolishly did against Canelo in their fight on December 15. Fielding gave Canelo the fight by going into sparring partner mode by backing up against the ropes and letting him tee off. Fielding, 6’1″, had a huge height and reach advantage over Canelo. He should have been able to use his size advantage to control the fight from the outside with his jab and long right hands. Fielding failed to do that. He let the much shorter 5’8″ Canelo walk him down, and hit him with body punches at close range. Jacobs isn’t going to fight that same fight against Canelo. By the time Jacobs faces Canelo on May, he’ll have watched his fight with with Fielding many times, and he’ll know what not to do inside the ring. Jacobs also won’t make the same mistake GGG did by staying in the pocket and letting Canelo get in range to throw his shorter punches. You can’t blame Golovkin for doing this though. He likely had no confidence in the judges that they would do their job by giving him a decision if he out-boxed Canelo from the outside. The judges didn’t give GGG the decision in the first fight when he jabbed Canelo from the outside the entire night, and they didn’t do it in the second fight either. Atlas wonders whether the judges no longer count jabs in factoring in their scoring. “It’s about time Canelo earns some of the money that was given to him by DAZN,” Atlas said. “They gave him something like $300 million dollars, and the first one came against a guy [Rocky Fielding] that put his ear muffs on and stood there and let him hit him with a left hook to the liver. That’s about $30 million per minute. That’s a little overpaid. I think they needed to put on a legitimate challenge in front of Canelo, and they came up with Danny Jacobs,” Atlas said.